The experienced detectives of our detective agency in Weimar investigate on behalf of private clients and companies, applying meticulous research and surveillance methods, and our results always stand up in court. Our fields of focus include private issues such as marital infidelity, responsibilities of custodial parents, custody cases, as well as employee checks, and the solving of (corporate) prosecutable crimes, for example, offences against property, burglary of a dwelling, unfair competition and cargo crime. Please, get in touch with our private investigators in Weimar for a non-binding and free call: +49 361 2243 0020. The culture-historical past of the urban district city Weimar is known beyond Germany's borders; the home city to many poets and composers like Goethe, Schiller, Herder, Bach, Liszt, and Strauss, attract around 350,000 visitors every year. Counting 63,818 inhabitants, Weimar is the fourth biggest city in Thuringia and impresses with its historical scenery, including memorials and art-historical exhibitions which are mainly focused on the time period from the 16th to the 20th century and on the cultural achievements of the city. Consequently, Weimar was listed a UNESCO World Heritage Site in 1998 thanks to the preservation of buildings and parks from the "classical Weimar". Our private detectives in Weimar, however, don't have much time for these sights, as their presence in the city is usually related to the surveillance of a suspect cheating on their partner or with checking a suspected employee who is working in a second job which was not agreed on by their employer and which, in fact, may also not be registered (illegal work), or they may simply be chucking a sicky. The majority of jobs in Weimar exists thanks to the city's historical scenery and the therewith associated tourism: 23,514 employees who were subject to social insurance contributions were registered in 2014, 11.2 % out of which in the manufacturing industry and 87.7 % in the service sector. Out of the latter, 37.6 % were employed in the hospitality industry (in hotels and restaurants). And yet not all of these employees are trustworthy – our corporate detective agency in Weimar is specialised in discrete surveillance of suspected employees and supports businesses in the region to solve these cases. 48.3 % of Weimar's economy are based on the service sector and 20.5 % on retail. With 30 %, the manufacturing industry plays a smaller role than in the GDR, but it is still a significant contributor. 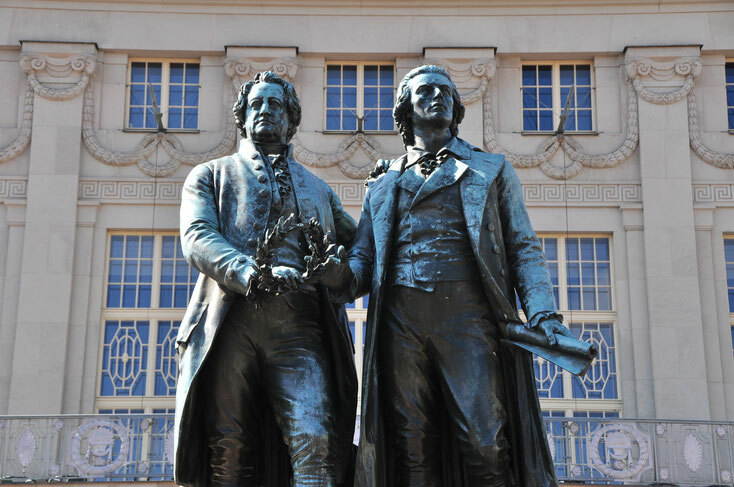 The Goethe-Schiller Monument in front of the Deutsches Nationaltheater represents the two best-known personalities from Weimar and it is the most important landmark of the city. An internationally known monument. Around half (around 12,000) of the employees working in Weimar are inbound commuters. This number clearly explains why the city's unemployment rate of 8.5 % (2014) lies so high above the nationwide average. The high unemployment rate may be one of the reasons for the increasing crime rate. Within the district of Weimar, offences have increased by 248 to 5,956 cases in 2014 while the crime clearance rate of 55.3 % continues to decrease. Within the city's area, 1,854 offences were registered. What is truly worrying is that the number of theft-related offences has increased from 288 to 507 (especially, burglary of dwellings and bicycle theft). That is an increase of approximately 76 % while the crime clearance rate for this type of offence only reaches an unacceptable 21.1 %! Specifically bizarre are the crime statistics concerned with offences against property and fraud: The number of cases has allegedly decreased by 182 to 486. But the reality is that those crimes which are committed in Weimar but where the offender flees to another country are no longer included in this statistic (2014). Long story short: It is easy to whitewash the facts. The authorities prefer to consider property crimes of minor importance because in many of these cases it is difficult to determine the offender, the effort that is necessary when faced with reputedly smaller damages is often thought to be unreasonable, plus, the law enforcement forces in Weimar, as well as those on a nationwide level, are often provided with poor technical equipment and they are understaffed. Our detective agency in Weimar never cuts corners when it comes to staff, technical equipment or the education of our investigators. Our IHK-certified private investigators have the necessary know-how and investigate every single case with an extremely high level of reliability and detail. We will gladly work on your case, too. You can send us a message via our contact form or give us a call. You may of course also book our detective services in the whole of the Weimar region and all of Germany. 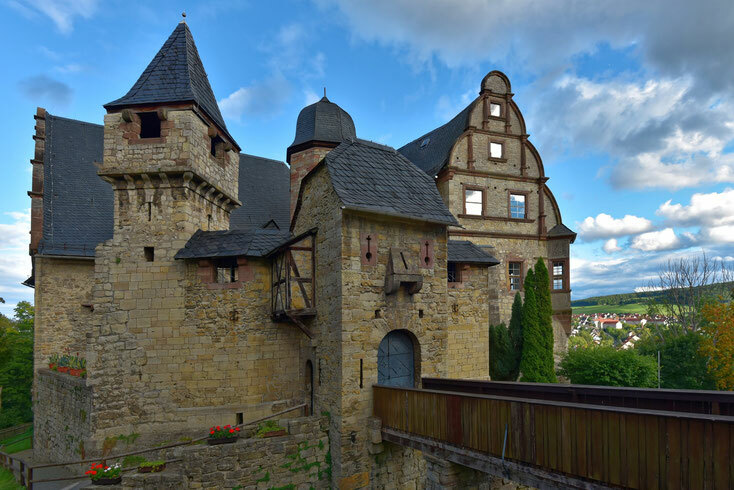 Picture: Oberschloss Kranichfeld, Weimarer Land.